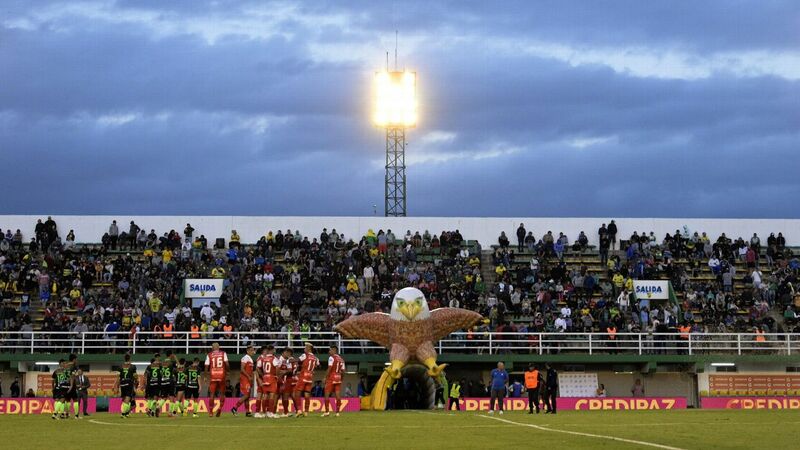 The Defensa y Justicia enter and leave the pitch through a giant falcon. There are times when the fixture computer seems to have a mind of its own, whirring away in pursuit of the perfect end to a season. The Argentine championship is a glorious example. Three rounds remain and just one point separates the two contenders, with Racing a nose in front of Defensa y Justicia. It is exciting stuff -- made all the better by the wonderful fact that the two teams will meet each other in the final round. This weekend they face teams at the other end of the table -- Racing at home to Belgrano; Defensa away to Patronato. Following a break for the internationals they are up against mid-table adversaries -- Racing away to Tigres; Defensa at home to Union. And then on the final weekend comes the clash which, hopefully, will decide the destiny of the 2018-19 campaign. If this was not sufficiently dramatic, the two-horse race is a classic David and Goliath struggle. Racing have been caught up in some financial confusion in the last 25 years. But, from the working class stronghold of Avellaneda on the outskirts of Buenos Aires, they have never been anything less than one of the giants of the Argentine game. They won the title every year between 1913-19, and have a total of 17 league wins to their credit, the last in 2014. Their light blue and white striped shirt recalls that of the national team -- the colours were chosen in 1910 in honour of the Argentine flag. By contrast, the garish yellow and green shirt of Defensa y Justicia has only been seen in the first division since 2014. They are a traditional neighbourhood club, from Florencio Varela in the south of Buenos Aires, who for most of their history made little impact outside the neighbourhood. Nicknamed "The Falcon of Varela" they leave and enter the pitch through a giant inflatable falcon. But there is something that unites the two teams: impressive young coaches. Racing are under the command of 44-year-old Eduardo Coudet. In his playing days, Coudet was a good midfielder, but never a great one. His time in Europe with Celta Vigo was brief and unsuccessful and he was one of those players who have to think about the game to shine -- the type that often makes a good coach. First with Rosario Central, and now with Racing, Coudet has shown himself well capable of producing intelligent passing teams. Defensa's Sebastian Beccacece is only 38. Never a professional player, he spent years as assistant to the fascinating Jorge Sampaoli. With his lean build and unkempt hair, Beccacece bears a passing resemblance to Shaggy, Scooby Doo's old partner, but the coach is blessed with much more courage than the cartoon character. His teams seek to strangle the opponent in their half, creating numerical superiority close to goal. His Defensa side are enjoying a splendid campaign -- last month's undeserved 1-0 home defeat to Boca Juniors is their only loss of the season. Two Defensa players, defender Lisandro Martinez and midfielder Domingo Blanco, have been called up the Argentina squad for this month's friendlies against Venezuela and Morocco. But until recently it would have been ridiculous to imagine that players from this humble institution might be lining up alongside Lionel Messi. Coudet and Beccacece have something else in common, too: both have a tendency to get over-excited on the touchline. There should be plenty to get excited about as the Argentine league moves towards its thrilling finale.